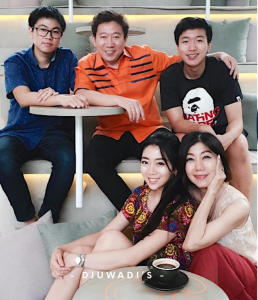 Mr. Handi Irawan D., Chairman of Family First Indonesia and the Vice Chairman of Family First Global, part of the Fellowship of Fathers Foundation, was originally from Solo, Central Java, Indonesia. He is the Founder and CEO of Frontier Group – a market research and digital marketing corporation with a venture capital division focused in investments of digital start-ups. As a prolific business man, Handi initiated various popular awards in Indonesia. He launched the National Customer Day which was inaugurated by the 5th President of the Republic of Indonesia and commemorated on September 4th by various major industries. He also founded ‘TOP Brand Award’, one of the most popular awards in Indonesia backed by 18 years of thorough market research. In 2013, Handi received the Australian Alumni Award for excellence in entrepreneurship, a prestigious accolade conferred by the Australian embassy. Handi is currently serving as Vice Chairman of The Board of South East Asia Biblical Seminary – one of the most respected Biblical Schools in Indonesia – and is also part of the Advisory Board in the Indonesian Counsel of Christian Schools. He is married to Mrs. Yuliana Agung for 25 faithful years. Together, they have 3 beautiful children, Gitta, Juan and Joel. As the head of the household, Handi believes he has to set an example for his family in the areas of financial, physical health, mental, emotional and spiritual well-being. As parents, they are dedicated to nurture their children to live by God’s divine plan according to their God given talents.